When I say bounce toys for toddlers, I am talking about things like bounce houses, single toddler trampolines and inflatable balls to hop and bounce around on. If you are looking for bouncing and riding toys to sit on like rocking horses, please go here. Bounce toys come in all shapes, colors and sizes. You will be able to find an appropriate bouncer for any toddler from the age of 1 year and older. For the younger ones the toys will be built lower to the ground with easy to hold handles for maximum safety. These are the toys that build physical confidence in toddlers and small children. Bouncing requires effort and energy. It builds muscle strength and helps your kids develop balance and fitness. An added bonus is that the exertion from a couple of hours a day on a bounce toy will tire them out and get them ready for a good nights sleep. These toys are portable and can be used indoors and out for year round enjoyment. Exercise and fun, that’s what it’s all about. Check out this great assortment of colorful and fun bounce toys for your toddlers enjoyment. This is a great way to keep your toddler active and full of energy. It is built low to the ground for safety and easy storage and is designed for 1 to three years of age. It has a sewn padded cover for safe bouncing and a padded grip easy to grip handle. It is easy to assemble and ideal for small spaces. 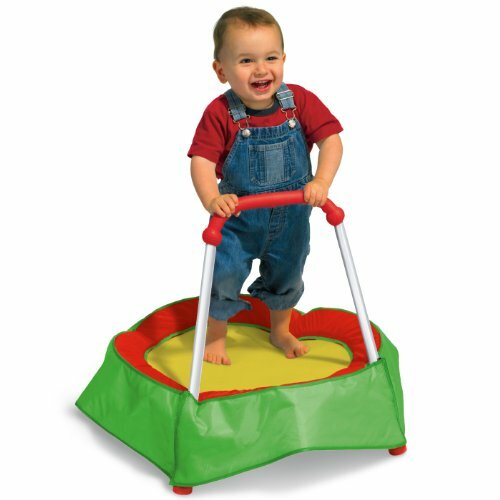 This starter trampoline will provide hours of hopping fun and exercise. Easily assembled in less than 5 minutes and comes apart just as easily for quick storage. It is recommended for kids between 3 and 7 years and is rated for up to 50 pounds. It measures 36″ around and comes with a circular safety pad that attaches with ease for extra safety. Good exercise with a safety bar to give the kids confidence and balance while bouncing. This colorful and fun toy is multi purpose in its design. Inflated baser ring and floor to bounce and play and also a crawl through door making it into a fun playhouse. Designed for 3 to 7 year olds this bounce toy inflates to about 6 feet in diameter and 35 inches high. 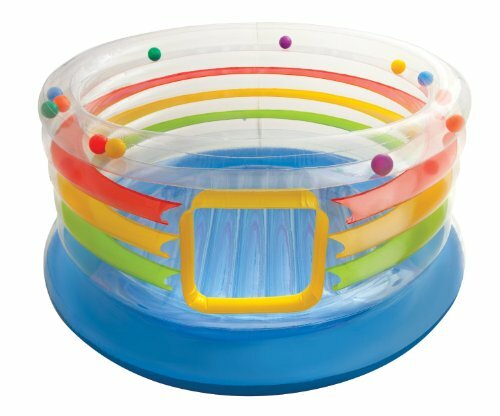 The sides are transparent so that parents can see in and it comes with twelve colorful balls that roll around the top ring. Recommended for ages 3 to 7 years with a maximum weight of 100 pounds. 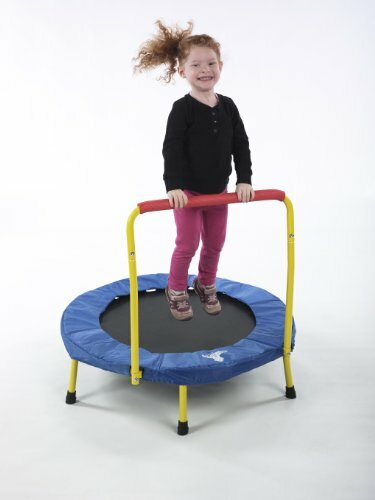 The gap free enclosure design attaches to the jumping surface eliminating gaps and the stretch bands provide a fun yet soft bounce with no springs and no worry about little fingers. The brightly colored pictures of zoo animals and soft padded handle will keep your toddlers entertained as they develop their motor skills and balance. A soft, padded cover protects from metal parts and the elastic bungee chords as they climb in and out. This great party bouncer is for the backyard and is recommended for ages 2 and older. It comes with everything that you will need to make your backyard the place to be all summer. It includes an over-sized storage bag, anchor stakes, patch kit and 110 volt blower for quick inflation. This is an ideal size for about 3 to 4 small kids at a time and will be a great investment. Why rent one when you can buy and have it available for use every day. It’s a must have addition for your backyard to keep the kids happy and entertained for hours a day. Bounce house and slide all in one. 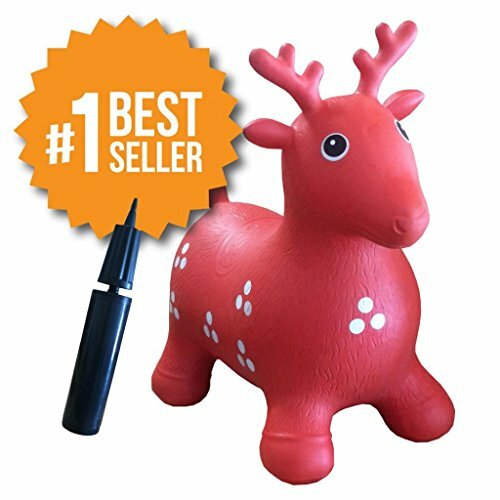 Bounce around the house or backyard with this fun inflatable bouncy deer. It is 23 inches from nose to tail and the seat height is 11 inches. It is made of soft latex and phithalate free vinyl and comes with a hand pump for easy inflation. Children under 3 years should be under parental supervision when using it. 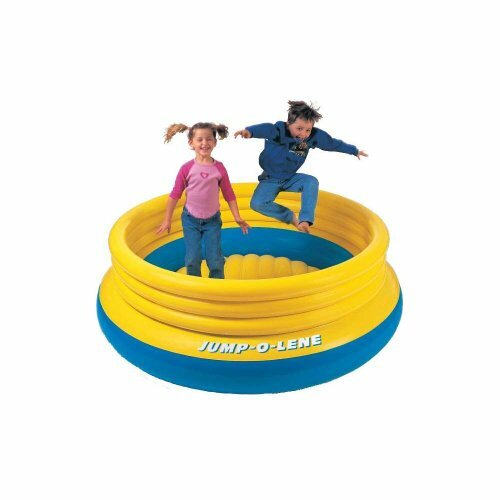 Bouncing from place to place on this fun toy will be healthy fun and will develop physical stamina, balance and coordination. This 4 legged space hopper bouncy horse is for ages 3 and up and its inflated size is approximately 23 inches from nose to tail. 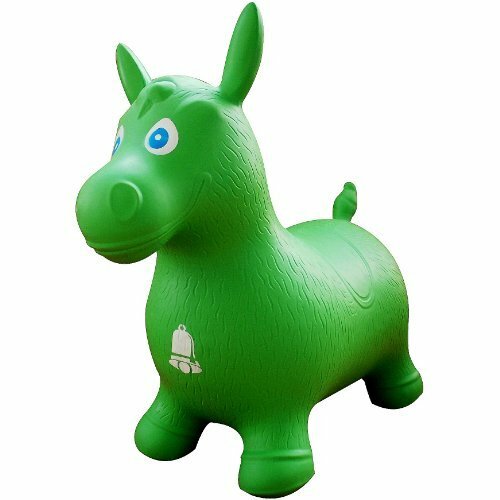 Toddlers learn balance and develop coordination while riding and having fun on this inflatable horse. Pump is included for easy inflation. This will become your child’s go to toy for fun and exercise for hours a day. This affordable bouncer is great for kids 3-6 and can be used by up to two jumpers or 120 pound capacity. The diameter is 80 inches and the height is 27 inches and it folds easily for transport and storage. The walls are high to prevent the toddlers from bouncing out. Great for exercise and hours of fun for the kids. 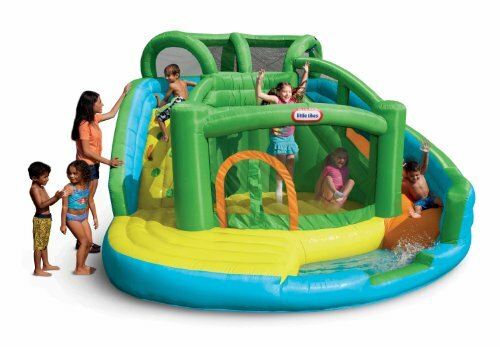 This one is a beauty and is twice the fun with a 2 in 1 inflatable wet or dry bouncer. The climbing wall leads to crawl-through tunnel and a large slide. Slide into the cool splash pool for soft and fun landings. This is designed for outdoor use only and has a large bouncing surface with a safety net entrance way. Comes with everything that you need. Heavy duty blower with GFCI plug and 4 blower stakes, storage bag, stakes for the bouncer, repair kit, hose assembly kit for water play. It is built for a maximum of 4 kids at a time and a weight limit of 350 pounds. 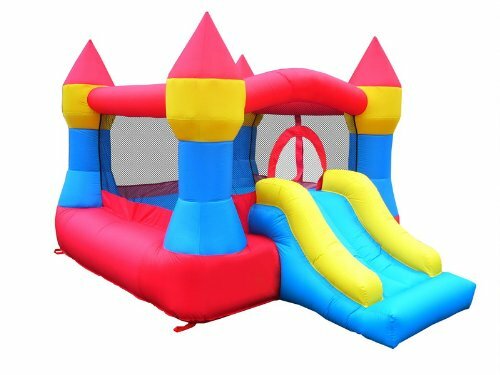 If you are interested in larger bounce houses and castles for older kids. GO HERE. 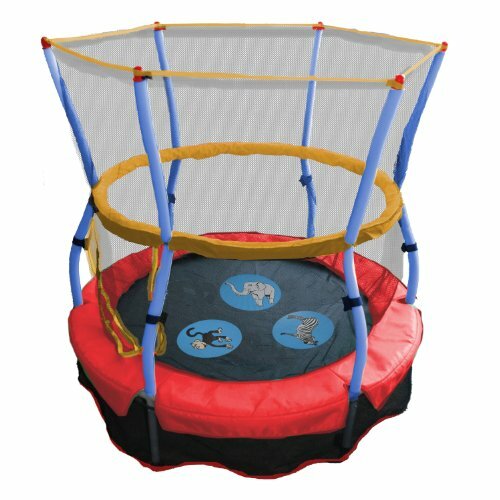 Looking for backyard trampolines for bigger kids. GO HERE.